Just looking at this watch, you can probably tell that it's not your run-of-the-mill Submariner. I mean, it's not even your run-of-the-mill big crown (and yes, we're now saying things like "run-of-the-mill big crown). First off, it has an Explorer dial, something super rare to see on a 6538. Then, if you look closer, you'll notice that the depth rating is both meters-first, reading "200/660" with no actual units present, and it's printed in red instead of white or gilt. Right here we've got the makings of a perfect storm Submariner. And, oh yeah, it doesn't have a bezel. Yep, you read that right. 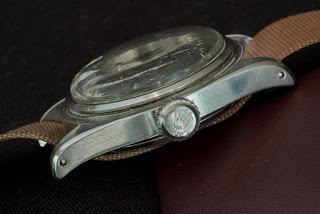 The watch comes from the original owner and supposedly he popped the bezel off years ago when working as a painter because paint would get between the bezel and the crystal and prevent it from rotating. He never put it back on before passing away in 2017 and his son (the consignor) left the watch this way. When I first saw this watch and its $500,000-1,000,000 estimate, my instinctive reaction was "Seriously? For a watch with no bezel on a too-small NATO strap?" But we all know that's now how things work and there's an important lesson to be learned here about where the value in a watch actually sits. This watch is coming fresh to the market from the family of an original owner who has a pretty strong story about having acquired the watch as an actual tool and then wearing it every day for decades. That always helps things along. Then there's the sheer rarity of the dial configuration and the condition of that dial, which is outstanding. The scratches you see are in the crystal and the dial, as far as I could tell at last week's preview, was in great shape. Finally, there's the honesty of the case, which doesn't look so sharp that you'd be concerned about tampering but also hasn't been ground down into a blob. It retains its original lines and looks like a worn-in watch. What I'm really interested to see is whether or not this watch ends up popping back up on the private market in the next year or two, fitted with a perfectly faded bezel and a tight, period-correct bracelet. To be honest, it wouldn't surprise me at all, and it will probably be given a nickname to go along with the increased price – the Aquaman or the King of the Seas or some such nonsense. That might sound jaded, but it's just the way the top tier of the market has been going lately, and I'm sure some die-hard will be happy enough to add it to their collection. However, it will be interesting to see if this watch will ignite a new type of collecting. One that goes beyond rarity into more nuanced territory. So, at this point, you might be experiencing a bit of déjà vu. That's because just last year, I wrote something not entirely dissimilar about another Submariner, which then set the world record price at $628,572. 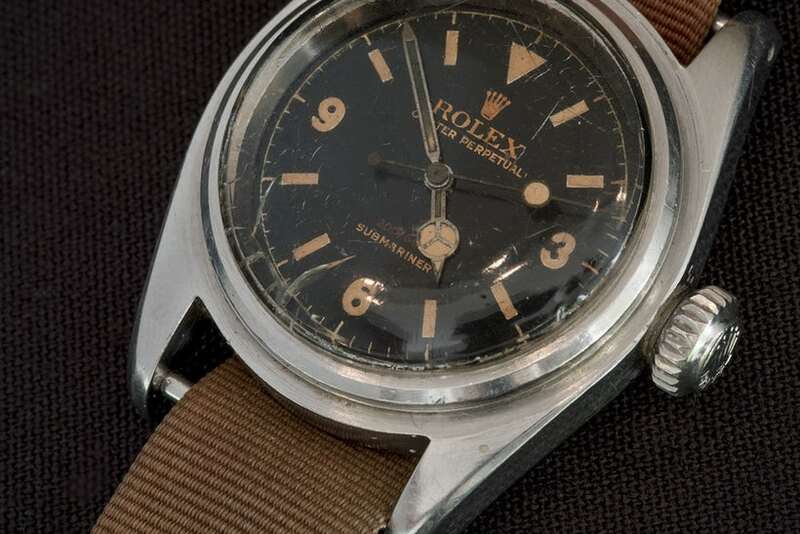 Now, that was a very different watch, and it achieved that price for very different reasons (primarily rarity and novelty), but if you bring something undiscovered to auction and tell a good story about it, records are up for grabs. That this watch nearly doubled the record price for a Submariner just 13 months later (and just eight months after this minty 6200 sold for $579,000) is a testament to the strength of the market overall and the interest Christie's was able to drum up in this watch. Rolex Submariner Becoming The Most Expensive Sub Ever，but in our watch store,you can find cheap replica Rolex watch with lower price but higher quality.Buy Quality fake Luxury Watches low to $149 with fast shipping worldwide from China,Swiss AAA Replica Cartier,Tag heuer,AP watches sale.